Les condos de luxe Las Mananitas jouissent d'un excellent emplacement sur une plage de sable blanc de 11 km, à quelques pâtés de maisons du centre-ville de San Jose del Cabo. Cette nouvelle 2BR spacieux condo possède une terrasse de taille plus avec des vues spectaculaires sur l'océan de la mer de Cortez et l'accès direct à la plage. Chaque chambre est câblé avec haut-parleurs pour profiter de la musique à travers l'ensemble du condo. Les installations comprennent des piscines, jacuzzi, une cuisine complète avec tous les appareils et ustensiles, y compris lave-vaisselle, aire de pique-nique, A / C central, téléphone avec accès Internet gratuit, télévision par satellite, services de conciergerie multilingues, sécurité 24 heures sur 24, buanderie et service de ménage disponible pour un petit supplément. Pour le confort, ces condos sont difficiles à battre! Haut-parleurs dans chaque chambre du Sound System. 5. 1 Dolby Surround. Fantastic property, beautifully furnished, with a gorgeous pool and ocean view! We are a family of 5, with the 3 children ages 10, 8, and 4 and this property was perfect for us. The furnishings and decor are beautiful yet substantial and well placed so that we didn't have to overly worry about our children accidentally breaking things. The management company was pleasant and helpful to deal with from beginning to end and we would happily stay here again. The unit had plenty of pool toys, puzzles and games for the kids. The kitchen is well stocked and we had zero complaints. Highly recommend. Great unit. Loved the decor. Very roomy and cozy. Had everything we needed. My only suggestion would be to have beach stuff, chairs and umbrellas, so we could have taken to beach. Had two issues while we stayed there and they were taken care of immediately. It was very impressive. Great location. Great condo. Great amenities. If you love Cabo and haven't stayed at las mañanitas before you have been missing out. 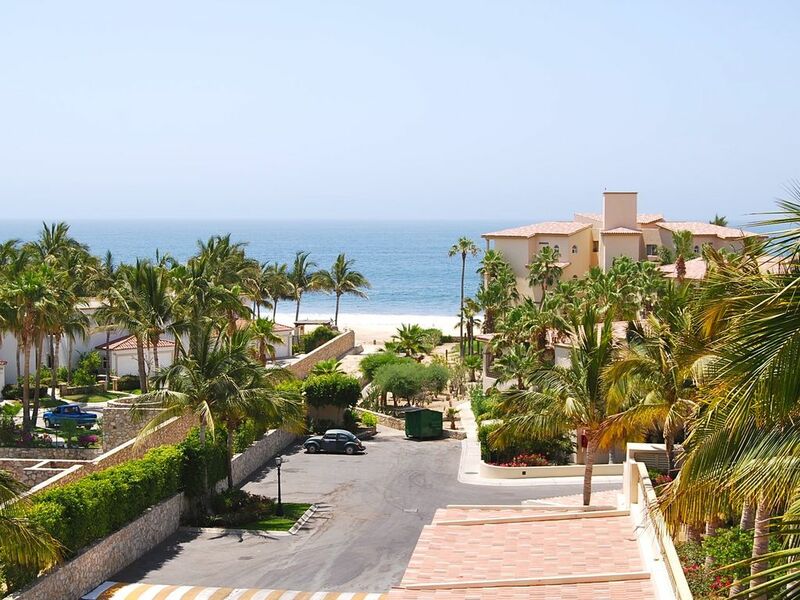 San José del cabo is Cabo San Lucas more pristine and low key neighboring city. It offers great dining and great beaches. Las mañanitas has incredible amenities ; 4 pools , 3 jacuzzis, tennis court, gym, onsite security and more. This unit is in the back building but is perched on a up hill slope with phenomenal views of the ocean and grounds. The unit is finished nicely with high end material. The layout is very spacious and both bedrooms are very private. The balcony is huge and offers another functional living space . We stayed here recently and loved our stay. The place is clean and well furnished. The decor makes it feel very homely and welcoming. The kitchen is well stocked, everything you need to cook a good dinner (we did several times) and all the appliances are updated. The ice machine is a big help! Beds were comfortable and bathroom/showers were clean and big. The place is quiet, couldn't hear much of anything. Big deck as well with a good view of the ocean. Even saw a couple of whales from the deck! The grounds are really nice, several pools so you can change it up where you relax. The BBQs worked great, cooked several times on them. It was very quiet when we were there so never had a problem getting a lounger by the pool. All in all, this is a great place to stay and we really enjoyed staying here. Highly recommend it! We rented 3 units (4301, 4306 and 3205) at this complex over Christmas 2016 and had a wonderful time. Each unit was distinct in their furnishings. Unit 4301 was the most opulent with the nicest furniture, but all units sufficed. The lighting in 4301 was slightly dark due to the color of the walls in spite of having numerous light fixtures so a little task lighting might be helpful. We also had a few things that were broken or broke while we were there (shower head, disposal, washing machine), but Keith was very responsive and repaired everything in a timely manner. The complex was beautiful and not very crowded with multiple pools, jacuzzis, hammocks, gym, tennis court, BBQs and outdoor dining areas, putting green and amazing views of the ocean. The property is well maintained and a joy to use. The Urbano bus (12 pesos) picks up right outside the complex for an easy way to go to town. Overall, I would highly recommend Las Mananitas! Las Mananitas est situé à proximité de tout. À distance de marche d'une grande épicerie / centre commercial, restaurants et bars.